Under a canopy of trees, akin to looking up at the night sky, there is a sense of being a small part of something bigger. Unlike the night sky, there are more immediate ways of experiencing the forest than the night sky. More accessible sounds, smells, sights, and textures to immediately experience. And if you pay attention to a forest long enough, there are changes you can see. As noted in last week’s post, tree extent has been reduced by 46% since the beginning of human civilization. The UN Food and Agriculture Organization (FAO) has a report out about the state of the world’s forests. As the Global Plant Council post notes, the rate of deforestation has slowed, which is good news. Douglas Firs, Oregon. Photo by Noel. Source: Flickr CC2.0. At the same time, fires continue to rage in the American West. Even though some of these forests are designed to resist fire, the drought combined with fire may be a devastating combination for large swaths of forest. De-forestation to use land for agriculture continues, especially in the tropics. 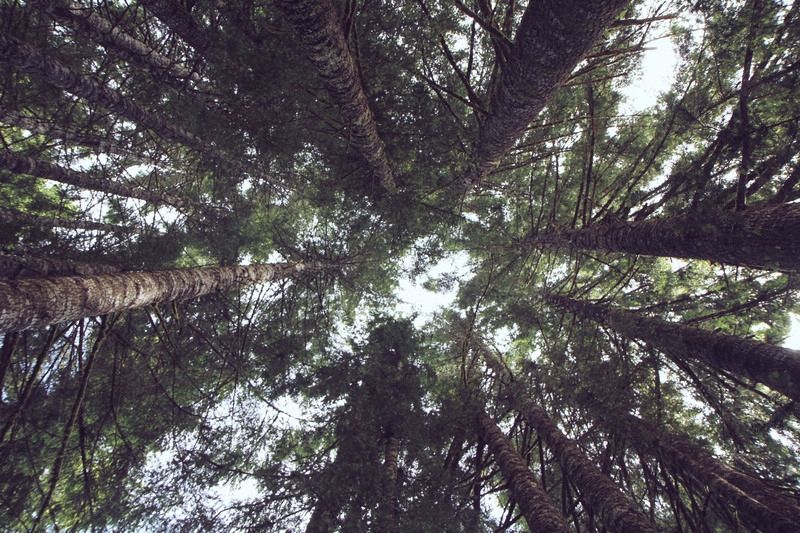 And of course, forests continue to be used as resources for building materials, paper, and other tree-based products. Forests also provide a lot of eco-system based services; cleaning water, air, and absorbing carbon dioxide, and providing habitat for a lot of Earth’s life. And then there’s plant pathogens. One classic example is the story of a tree, The American Chestnut (Castanea dentata). A few weeks ago on Kevin Folta’s Talking Biotech podcast, he spoke with William Powell who’s headed up an effort to bring back the American Chestnut through a transgenic (i.e. GMO) strategy. The genetic modification strategy isn’t the only one to try to save the American chestnut. A breeding approach has also been taken, by crossing resistance genes from the resistant Chinese chestnut tree into The American Chestnut. Some readers may have never heard of The American Chestnut, but it might have been considered the counterpart to the vast conifer forests of the West, like the Douglas fir (Pseudotsgua douglasii). The American chestnut dominated eastern forests from Georgia to Maine (1 in 4 trees was a Chestnut). Until a blight, a fungus, from Asia was introduced with imported Chinese Chestnut trees. With no resistance, the blight wiped out almost all The American Chestnut trees. There are still stumps with good roots that do send up shoots occasionally, until the blight comes and destroys them (and even a very few full trees). These were big, strong, trees that were both an important part of the ecosystem, as well as providing wood and a crop of chestnuts for people (“Chestnuts roasting on an open fire” refers to American chestnuts). A big feature of wood from the American Chestnut is that it was quite rot resistant. As hinted above, it’s a tree that we could potentially bring back in some form. The strategy they used is a clever one to disarm the fungus. The researchers engineered the tree to produce an enzyme that can disarm a chemical: Oxalic acid or oxalate. Dr. Powell told Dr. Folta that the latest generation of their transgenic chestnut has high resistance to the chestnut blight. The strategy they used is a clever one to disarm the fungus. The researchers engineered the tree to produce an enzyme that can disarm a chemical: Oxalic acid or oxalate. The fungus needs oxalic acid to effectively infect the chestnut. Thus Powell and colleagues took a gene encoding an enzyme called oxalate oxidase from wheat and placed it in the genome of The American Chestnut. And though it took many years, it appears to work. And based on a recent article in press, it can be transmitted through to the T1 generation (that is, one generation beyond the initial genetic engineering event). The idea of both American Chestnut programs is to get a wild population of American Chestnut trees growing again. Though neither is 100% American Chestnut, it can be argued that the transgenic version is closer to the 15/16th American Chestnut the breeding program has achieved. The transgenic approach, of course, has to undergo regulatory approval from the EPA, FDA, and the USDA. Inserting one single gene into a genome is not even close to a full 1/16 the size (in base pairs) of a single plant genome. 1/16 is equal to 6.25%. That’s how much of the Chinese chestnut genome that has the blight resistance genes needed for resistance (as well as any DNA that’s near those genes that tends to come along for the ride in traditional breeding techniques). I don’t know how big the transgene Powell’s team inserted in the American Chestnut genome, but a generous number for such things is 100,000bp (that’s a vast over-estimate- typical transgenes are less than 30,000 basepairs). And I’ll use the smallest known plant genome: Utricularia gibba that is 77 megabases (or 77,000,000 base pairs). Doing the math 100,000/77,000,000 = 0.0013, or 0.13%. The American Chestnut genome is undoubtedly bigger & so that percentage would be even lower. So what is more “natural”? Tests are ongoing. But the oxalate oxidase strategy is showing great promise. It doesn’t kill the fungus, it neutralizes it. They used a gene we eat from wheat already (that has nothing to do with gluten), and the fungus is not as likely to develop resistance (nor have the selective pressure to do so- the fungus will still live & reproduce), as can happen with traditional resistance genes in plants. Is using biotechnology to bring back a species in it’s most close-to-natural state better than cross-breeding? Closer to the original? With all the controversy about GMOs, transparency, etc. this chestnut project highlights a lot of things about biotechnology. The first is that genetically modifying an organism is not any one thing, it’s a process, in this case using an enzyme that breaks down an acid (so not a herbicide resistance gene or a pest toxin). Is using biotechnology to bring back a species in it’s most close-to-natural state better than cross-breeding? Closer to the original? And this is a project undertaken with mostly public funding and is a not-for-profit organization. This is about restoring something that humans took away. And would benefit from. It’s a long term project. Does that make it more pure? And would we be able to tell the difference in a restored forest full of transgenic chestnut trees from the original? Forests are important. Trees are critical to our lives. And perhaps restoring a species to it’s former place (with either breeding or transgenics) can help ensure a healthy environmental future, one that humans are a part of, can touch, and experience.